I'm really excited to be a guest teacher in The Journey Within 2016: A Year of Handmade Art Journals with book maker extraordinaire, Kiala Givehand. I'll be teaching along side 16 other amazing artists. The class starts on January 1, 2016 and lasts for the entire year! Each month, Kiala will teach you how to make your own handmade art journal, give you prompts, tips and techniques for filling the pages, and bring in guest artists to share their take on the themes and prompts, and to share their art journaling process. To kick off this fun course, Kiala has created a book for December and asked each guest artist to give her a challenge to complete during the month. Today is my day! I challenged Kiala to use stitch or thread 3 ways. I decided to create a journal page, too! The background is several colors of Gelatos. 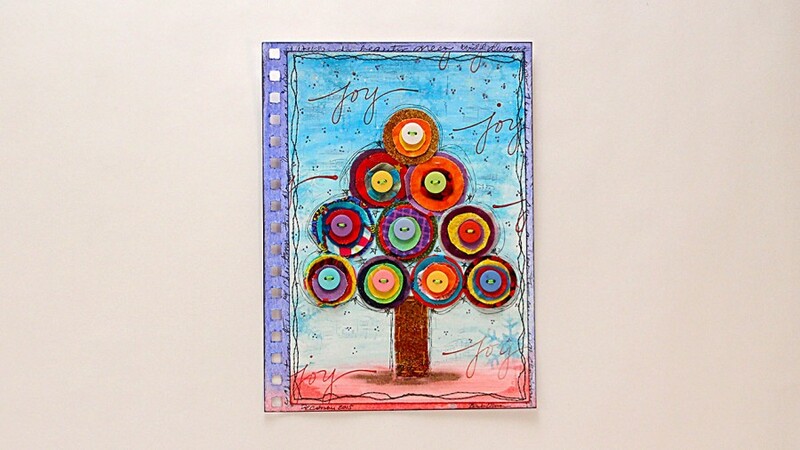 The tree is created with circles of scrap fabrics with a button machine stitched in the center of each. The tree trunk is hand stitched to the page with perle cotton and the entire page is stitched with machine free-motion stitching to another page in my journal. I loved challenging myself, as well as Kiala! Are You ready to take the challenge? Join us for this amazing adventure! To learn more and sign up for the class, click here. If you decide to try the challenge I gave Kiala, leave a comment with a link to your blog or tweet me @BarbOwenDesigns so I can see your beautiful interpretation. *** I have the privilege of giving away 1 seat in the class!! To be entered in the drawing, leave a comment below before December 21 at noon eastern. The winner will be announced before the class begins. Remember to Get Creative today! It's Easy! PS Don't forget to leave that comment!